TWO STONE STEPS SURMOUNTED BY A STONE MEMORIAL WALL DIVIDED INTO THREE INSCRIPTION PANELS SEPARATED BY COLUMNS. 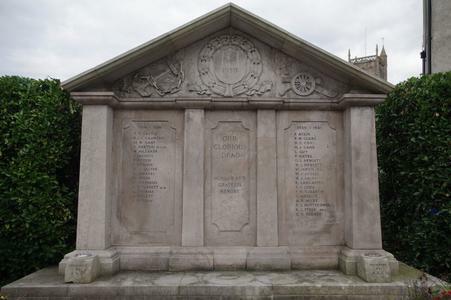 NAMES TO THE LEFT AND RIGHT WITH INSCRIPTION WORDING IN THE CENTRE PANEL. LARGE PEDIMENT ACROSS ALL THREE PANELS HAS ANCHOR CARVED IN RELIEF ON LEFTHAND SIDE, WREATH WITH SHIELD BEARING DATES IN THE CENTRE AND ARTILLERY CANNON WITH AEROPLANE ABOVE ON THE RIGHTHAND SIDE.